There are numerous fun things to do in Kauai, Hawaii, for entertainment, exercise and education. You can decide to take a stunning biking tour of the Waimea Canyon or perhaps go snorkeling off the shore of the Forbidden Island of Niihua. You can visit a historic lighthouse at Kilauea, make a stop at the Kilohana Plantation or just simply relax on the black sands of Black Pot Beach. You can view famous waterfalls like Manawaiopuna Waterfall where Jurassic Park was filmed or look at 10,000 fossils at the Makauwahi Cave Reserve. You can revel in a sunset dinner cruise or go kayaking on the Wailua River and take a short hike to Secret Falls. 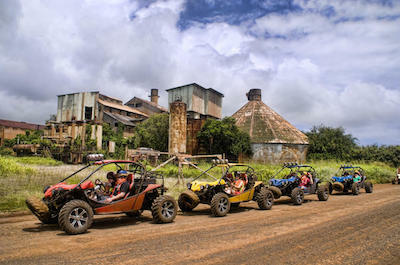 No matter what you are looking for in adventure there is a great excursion for you and family on Kauai. Cultural tours are a great thing to do in Kauai to understand the many layers of history and culture that exist on the Garden Isle. You will be pleased with the selection of tours that teach you and your family about early Polynesian habitation, plantation lifestyle and current immigration that has helped the culture of Kauai explode over the years. Luaus are one of the best ways to understand the early culture of the Hawaiian Islands with hula dancers and drum beaters telling stories of gods, goddesses and mystifying people of the islands. When you taste the food you will be surprised on how many cultures have influenced the cuisine over the years of habitation. You can learn about the early plantation owner’s lifestyle by attending the Luau Kalamaku which is situated at the Kilohana Plantation and you can even take a tour of the working farm on a historic replica of the Kauai Plantation Railway. Snorkeling is one of the more popular things to do in Kauai for families and travelers who are seeking an underwater adventure. There are a wide variety of snorkeling excursions that are perfect for beginners and experts who like to view marine life in its natural habitat. You can take a sail boat, raft or even a custom yacht to your snorkeling destination. You can visit the stunning coral reefs of the shoreline of the Forbidden Island of Niihua or you can watch sea turtles, puffers and surgeon fish off the north shore at Anini Beach. You can take an excursion underwater wearing an Aria snorkel mask which offers full face coverage and all snorkeling tours include the necessary equipment. An added bonus to these adventures is the scenery of Kauai from the Pacific Ocean as well as maybe spotting a humpback whale or spinner dolphin while you cruise along the Pacific Ocean. Traveling and learning about history tends to go hand in hand and one of the best things to do in Kauai when you want to learn more about the history of the Hawaiian Island is to take a history tour. 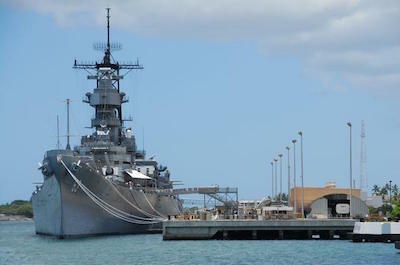 One of the more interesting tours is to take a day trip to neighboring Oahu where you can visit the stunning monuments at Pearl Harbor, the National Cemetery of the Pacific at Punchbowl as well as view the interesting and historic architecture of downtown Honolulu City. Other options would be a trip to the fabulous Makauwahi Cave Reserve where you will find the largest collection of fossils on the Hawaiian Islands. You can learn the geologic history of Kauai with a stop at Waimea Canyon which is known as the Grand Canyon of the Pacific and you can get a glimpse of the gorgeous area that surrounds Fern Grotto. 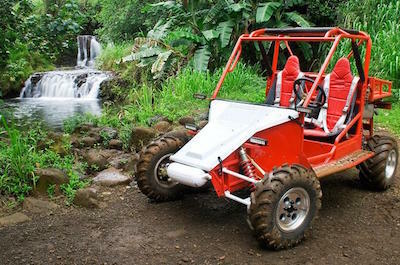 If you want a true adventure in a stunning tropical landscape, then the perfect thing to do in Kauai is to go on a 4WD and ATV tour of the Garden Isle. You have several to choose from that lets you decide whether you want to drive a jeep, a dune buggy or ride in a comfortable 4x4 van. You will venture to unchartered areas of the island that can only be reached by these powerful vehicles. You can go on an extreme drive through Kipu Ranch or visit the filming locations of the 2001 To End All Wars, Jurassic Park and the Menehune Fishpond where Indiana Jones: Raiders of the Lost Ark was created. Other exciting stops are at numerous waterfalls where you can even go swimming if you choose. Whether you want to see wild pigs in the tropical forest or the Opaekaa Falls there is a perfect excursion for you. 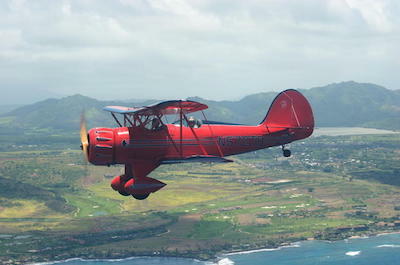 One of the best things to do in Kauai for first time visitors or people who want to see as much tropical scenery as possible is to take an air tour. You will be excited as you take off in a vintage bi-plane or a more GA8 Airvan which has expanded viewing windows. You will fly over such incredible scenery as the Waima Canyon, the Na Pali Coast, Hanalei Bay and the massive crater of Mt. Wai’ale’ale. You will have a superb vantage point to view the numerous waterfalls within the Hanalei Valley and the spectacular cascading waters at Manawaiopuna Waterfall where Jurassic Park was filmed. Other interesting places like the Menehune Fishpond will be explained by your pilot and the beautiful secluded Mahaulepu Beach is absolutely stunning from the sky. Get your camera ready before you board the aircraft because you might even spot a humpback whale swimming in the Pacific Ocean. 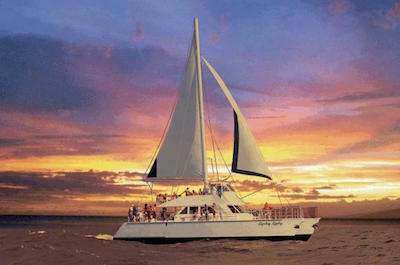 The most romantic thing to do in Kauai is to take your loved one on a fascinating dinner cruise. You will be pleased when you book one of these excursions that include a view of the spectacular scenery of the Na Pali Coast from the Pacific Ocean. While you are on board a state-of-the-art catamaran or exclusive luxury yacht, you will be thrilled with the extra perks of a dinner cruise. You can relax while enjoying your favorite libation as the captain and crew explain interesting tales of the island before you sit down to indulge in a buffet or sit-down style gourmet meal which features many of the Hawaiian Islands favorite cuisine. You can watch the sunset over the blue waters of the Pacific Ocean as the sky turns into a canvass of pastel colors and the stars at night are spectacular with little light pollution. One of the more interesting things to do in Kauai to view the natural landscape on the Garden Isle is to try a sailing tour. Kauai is packed with gorgeous tropical scenery and when you try a sailing excursion you will enjoy a whole new perspective of the landscape. 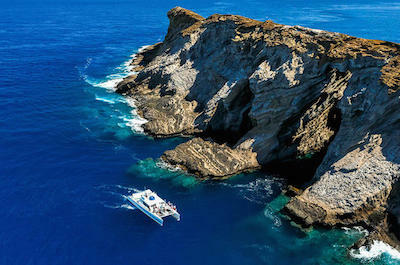 You can sail the Na Pali Coast where you will view stunning secluded beaches, numerous sea caves and even the Forbidden Island of Niihua. You can also choose to add-on a beautiful underwater adventure like snorkeling which will have you watching hundreds of tropical fish as well as the brightly colored coral reefs of Kauai. Another added bonus is the marine life from humpback whales to spinner dolphins to sea turtles that you will watch swim in their natural habitat. Whether you are looking to spend a half or full-day on the blue waters of the Pacific Ocean, there is a perfect sialing excursion for you. If you or your family are movie buffs and like to view interesting places where movies were shot, then the best thing to do in Kauai is to try a movie tour. You will be amazed at the amount and types of movies that have been made on Kauai that features the stunning scenery of the area. You can visit iconic places like Wailua Falls which was the backdrop for Fantasy Island and Coco Palms is home to Blue Hawaii and Pirates of the Caribbean. Kapa’a Town is home to Jurassic Park as well as the Kilauea Lighthouse Overlook is where much of Lilo and Stitch was created and don’t forget the Hanalei Pier where South Pacific made the pier famous. You can travel by comfortable coach or by off-road vehicle to view these incredible places that left lasting memories on the big screen. One of the most popular things to do in Kauai is to take your family to a stunning luau on the Garden Isle. You will be thrilled with the entertainment and the freshly prepared Hawaiian as well as Polynesian influenced cuisine that you will experience. Your family will learn of folklore, culture and mingle with native Hawaiians that are proud of their island traditions. 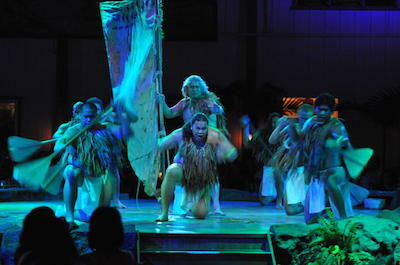 Your family will be pleased with the beautiful hula dances and dancers as they sway to authentic music portraying stories of travel, gods and health from around the Polynesian Islands. Some luaus offer additional benefits like the Luau Kalamaku which is located at the Kilohana Plantation and you can sit on the beach at the Kauai Luau while you enjoy a tremendous evening of fun as well as watch a picture perfect sunset over the Pacific Ocean. 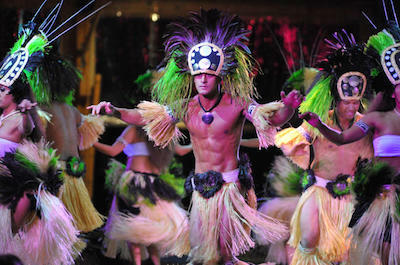 No matter which you choose, luaus are a must do in Kauai. One of the most ideal things to do in Kauai for first time travelers to the Garden Isle is to take a comprehensive sightseeing tour. Sightseeing excursions are great way for you to get familiar with the island which allows you to plan for more excursions that suite your taste. These excursions range from a land, river and air tour to viewing waterfalls while riding in a comfortable coach to kayaking on the Pacific Ocean. You can visit Waimea Canyon, Spouting Horn and the Kilohana Plantation where you will learn about the early plantation days on the island as well as attend a luau. Other options include visiting the Hanalei Pier and Black Pot Beach where the sand is as dark as night or viewing marine life from Wahi’awa Bay. Most sightseeing tours last more than half a day are an excellent way for your family to learn about the culture and history of the Kauai. 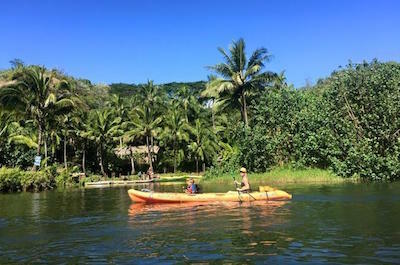 One of the most popular things to do in Kauai is to take a kayak or canoe tour while you are visiting the Garden Isle. You can paddle off the Na Pali Coast where you will find secluded beaches and sea caves or you can paddle on the more serene waters of the Pacific Ocean off the south shore with stops at Lawa’i Beach. You will be thrilled with the marine life such as humpback whales, spinner dolphins and sea turtles that are swimming in their natural habitat. Other options include a short paddle up the Wailua or Hule’ia Rivers where you can hike to various waterfalls like Hidden Valley and Secret Falls. Most excursions will fit into your planning with selections from a half to full-day tour. You can find a kayak or canoe excursion that fits all skill levels from novice to expert that will leave you with lasting memories. 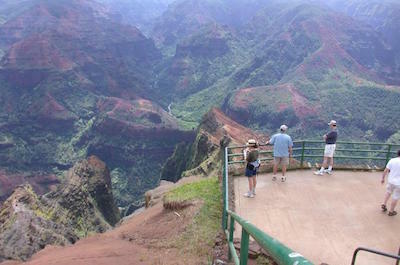 A popular thing to do in Kauai for families and people who like the outdoors is to go on a hiking tour. Hiking excursion vary from a grueling day on the Kalalau Trail to a leisurely walk to Secret Falls to finding a secluded beach in the Na Pali Coast Wilderness State Park. You will be amazed at the variety of the terrain you can experience in Kauai from old plantations to the incredible views from Waimea Canyon to visiting lava tubes and caves near Princeville. Other exciting options include kayaking on the Wailua River or the Hule’ia Rivers before you set off into the jungle to view incredible waterfalls. You can choose an excursion that lasts a couple of hours or an all-day hike into some of Kauai’s most remote and surreal areas while you learn about the fascinating eco-system of the island. Many people want to experience nature while visiting the Garden Isle and the perfect thing to do in Kauai is to take the family on an interesting nature tour. 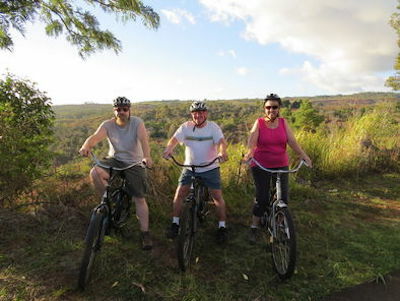 There are a wide variety of these excursions available which range from bicycling in Waimea Canyon to a sunset cruise of the Na Pali Coast to soaring in the air on zipline while you take in the surrounding scenery. Other options include a fantastic trek to Makauwahi Cave Reserve, a trip to Maui to watch the sunrise atop Haleakala and you can go kayaking to such places like Fern Grotto, the Wailua River as well as Hidden Valley Falls. And let’s don’t forget the incredible amount of other waterfalls you can visit in Kauai with some having cascading water for over 1,000-feet. No matter which excursion you decide to try, you will learn about the eco-system and experience the best tropical scenery on the planet. When you are ready for an extreme adrenaline rush that is family-friendly, then the best thing to do in Kauai is to take a zipline excursion. 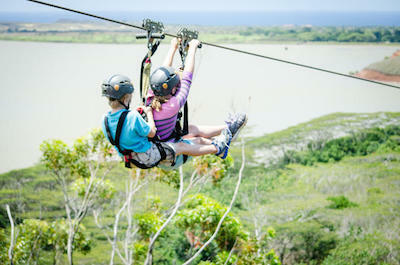 There are several you can choose from with varying departure times and zipline tours last from 2.5 to 4-hours. You will visit such places the Old Koloa Sugar Plantation, Waita Reservoir and the surrounding tropical forests of Lihue as well as Poipu. You can soar up to 200-feet in the air through the tropical canopy and Norfolk pine trees while taking in big views of scenery including the Pacific Ocean from above. You can experience short ziplines and some as long as .5-miles in length. You will be thrilled walking across canopy bridge crossings to your next exciting zipline and you can try the Monster Swing which will drop you from 60-feet in the air or try the swaying climbing wall which is a unique feature on Kauai. Waimea Canyon Bike Tour When you want to go bicycling in one of Kauai’s most beautiful places, then the perfect thing to do in Kauai is to try the Waimea Canyon Downhill Bike Tour. Your 4.5-hour excursion has two departure times during the day and begins when you meet your tour guide at Poipu Plaza where you will be fitted with all the necessary safety equipment and a bike. 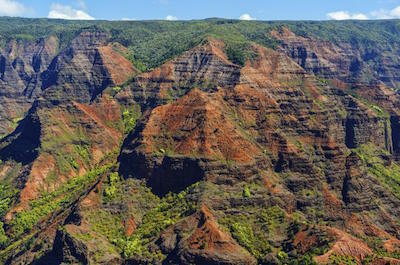 You will then be transported to the top of Waimea Canyon which is known as the Grand Canyon of the Pacific. You will start your 12-mile ride through the Waimea Canyon State Park and Koke’e State Park at 3,600-feet above sea level and travel downhill on a paved road. You will stop at lookouts for photograph opportunities that include Waimea Canyon, the forbidden island of Niihau and the surrounding tropical landscape of both scenic parks. There will be breaks for muffins or cookies along with chilled water to keep you hydrated and your expert guide will explain more about the history of Kauai and the eco-system of this enchanted island. Your excursion concludes when you reach the blue waters of the Pacific Ocean and where you will be transported back to Poipu Plaza. One of the more popular things to do in Kauai for families is to go on a horseback ride through the stunning tropical scenery of the island. You have a good variety of places to horseback ride that include the south shore and north shore. Along the south shore you can visit such places as Secret Beach and the gorgeous landscape of Maha’ulelpu wilderness area. The north shore boasts horseback rides to Silver Falls, the Kamooka Mountain Range and stunning views of the Kilauea National Wildlife Refuge. You can include lunch with your excursions or just go for a quick dip in one of the water holes or Pacific Ocean to cool off. Horseback rides are great for singles, couples, groups and families who want to spend a day in the saddle in a tropical paradise. 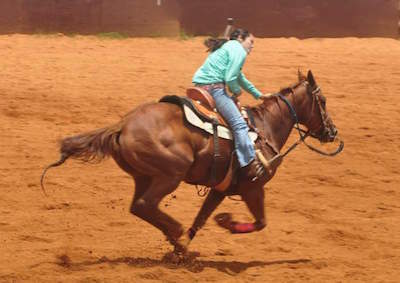 When you want to go horseback riding on the south shore of the island, then the ideal thing to do in Kauai is to take an excursion with CJM Stables. Located on the south shore of the island near Poipu, CJM Stables conducts guided horseback rides through the incredible landscape of the Maha’ulepu wilderness area as well as to several beaches. CJM Stables has two distinct horseback rides for you to choose from which are a 2-hour ride which include a beautiful ride through Maha’ulepa and a ride on the beach. The second excursion is 3.5-hours with a stop at Secret Beach for fun on the sand and a complimentary lunch. 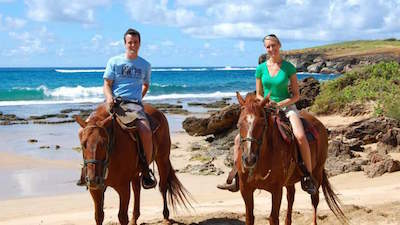 These horseback rides are ideal things to do in Kauai for families, couples and groups that are looking for an entertaining day about learning more about Kauai history as well as tropical landscape. A visit to Silver Falls Ranch is the ideal thing to do in Kauai when your family wants to get out in the natural landscape and take a terrific horseback ride through this island paradise. Located along the north shore of the island near Kilauea, the Silver Falls Ranch is situated on 300-acres that are adjacent to the Kilauea National Wildlife Refuge and the Kamooka Ridge. Silver Falls Ranch offers a variety of horseback excursions that range from a 90-minute ride through the green tropical landscape to a 2-hour ride that includes lunch and swimming at Silver Falls to a 3-hour tour that includes Silver Falls, Lunch and a view of an ancient volcanic caldera. Silver Falls Ranch offers group rides and private rides can be scheduled in advance. 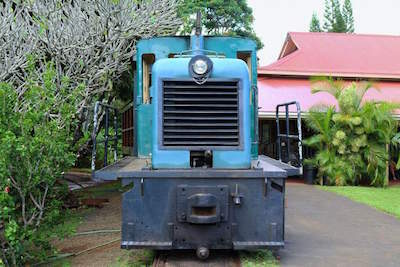 Everybody in the family likes trains and the only thing to do in Kauai when you want to ride a train through a former plantation is to take a trip on the Kauai Plantation Railway. Located on the former Kilohana plantation near Lihue, the Kauai Plantation Railway is a perfect way for the family to explore history and the natural scenery. First you will board a replica train and tour the working gardens as well as farm while you listen to interesting commentary on the lifestyle of early plantation owners from your train conductor. 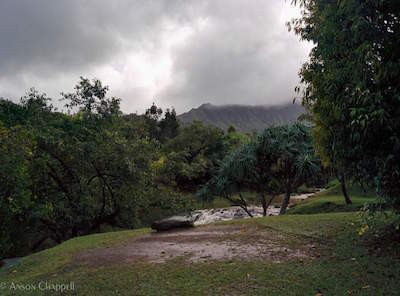 When you train ride is finished you can enjoy other things to do in Kauai such as relaxing hike through the lush tropical landscape that surrounds Kilohana. After your leisurely walk viewing the hundreds of flowering trees and local flora plants you will indulge in a superb picnic lunch complete with cold beverages. 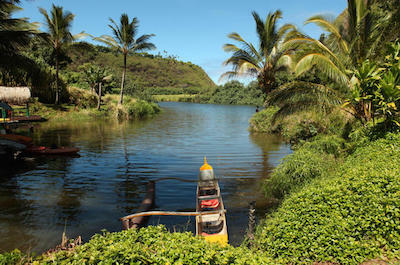 Your day is complete with more knowledge on the history of plants, plantation and trains from the early days on Kauai.